My husband’s first church was in a little town in central Arkansas (population 202). It was a quaint little town, stuck in the 50’s. We knew all of our neighbors. People waved as they drove past. Those walking down the street would stop and talk to you. We went to Crime Watch and played softball at the park. I did aerobics at the community center and my husband was on the volunteer fire department. Everyone in the town knew you and you knew everyone in the town. People didn’t need an invitation to stop by for a visit. My family loved living there and living in a “glass house” didn’t bother us. We wanted our church to know that we were the same in our home as well as outside in the community. 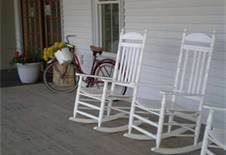 Everyone had a front porch and we would often find them sitting on it. In fact, my first Ladies Bible study was held on a front porch. One mid-morning Tuesday a dozen ladies gathered up for a luncheon, sweet tea, and the Word of God. Living there was a good experience for us. Today we live in a far different atmosphere. I do not know my neighbors. In fact, since we’ve lived in town, we have had a hard time meeting even our next door neighbors. People are busy. Garage doors stay closed. Blinds stay shut. No one sits on their front porch because no one has a front porch. Sometimes we hear our neighbors in their backyard, but even that is seldom. Several months ago we tried to meet our new neighbors who just moved in. My husband took over a plate of homemade chocolate chip cookies to welcome them into our neighborhood. As it turned out, it was the cleaning people. They enjoyed the cookies, I’m sure. That is until they get online……..
You see, it’s not that people don’t necessarily want to get to know people. It’s just that they don’t want to get to know them face to face. They don’t want to sit on their front porch and visit with a neighbor over a cup of coffee. That takes too much time. It’s too much of an investment. There is a risk associated with it. It involves real people. But, the “new” front porch is a different story. This front porch can be anywhere. It can be in your bedroom, the car, at work, during church service, at the doctor’s office, or on the playground. In fact, on those rare occasions when we are actually visiting with someone face to face, we can still be sitting on our own “front porch” interacting with someone entirely different. This new front porch has many names. You might recognize it at Facebook, Twitter, Skype, texting, or basically any type of social networking and virtual connections. It really is a strange phenomenon. There are people who will not take 3 seconds to look another person in the eyes when greeted. Yet, these same people will tell the whole world all the happenings of their day. We know what they ate for breakfast, where their spent their last dollar, what games they play online, what TV shows they are watching, the status of their ingrown toenail, and all their personal problems. There are people who have 4,000 “friends” online, yet could not name 3 “real” friends who would be there if needed. They will proudly announce to the world their private sins in the form of a status update, yet would never dream of confessing their faults to the church (James 5:16). Indeed there is a façade associated with the “new” front porch, but is it more ominous than all of that? My concern is toward the Christian community. Has all of this online interaction become a surrogate church of sorts? Let me explain. Just today I was reading a post by a young mother who was pouring out her heart and begging for encouragement from others in this certain online group. My heart immediately went out to her, but not necessarily because she was having family troubles. I was sad for her because it appeared that she did not have anyone (other than an online Christian group) to talk to. What a sad commentary for the local church. Tell me, can someone typing ((hugs)) really replace a friends presence? Like so much of technology there are pro’s and con’s associated it. I like Facebook. I love seeing pictures of my family and friends. I like being able to seed messages and connect with those I know. I enjoy being able to send a short text to someone. It simplifies communicating. Emails are great. I would much rather type a letter to a friend than take the time to write one out on paper, it’s faster. And Skype sure comes in handy when my husband and I travel. We can still see the children, pray with them, and tell them goodnight “face to face.” Technology should enhance communication; it should not replace it. As with all of technology there is a fine line. Do we embrace it or shut it off? I think I will invited a friend over for a cup of coffee and sit outside on the deck to discuss it. Some “real people” interaction sounds nice. On second thought, I’m too busy for that today. So, I think I’ll throw this up online. If you want to sit on my “front porch” for a while leave a comment. Thanks for the invitation. I’d rather drive 650- 700 miles to really sit on your front porch and talk face to face. But since I can’t do that I suppose this comment will suffice. I LOVE YOU MY FRIEND.